Plane Change Angle (degrees) Figure 5.13. Velocity increment as a function of turn method. As shown in Figure 5.13, the aerodynamic plane change requires much less energy than the impulse turn. 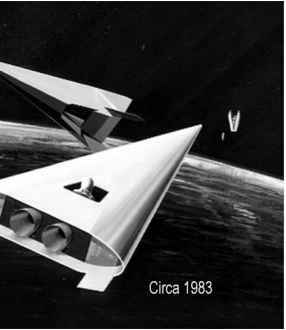 For the Model 176 hypersonic glider configuration the incremental velocity required is about 40% of the impulse turn requirement. Even a rather modest Dynasoar lift-to-drag ratio of 1.88 offers a plane change requirement of order 60% of the incremental velocity required by an impulse turn. The current Space Shuttle has a lift-to-drag ratio of about 1.5, and the Russian Buran had a lift-to-drag ratio of about 1.7. It is the blunt leading edges and nose plus the winged configuration that reduces their lift-to-drag ratio. Figure 5.14. Aerodynamic turn at 245,000 ft at 22,000 ft/s. aircraft is then leveled at the correct orbital heading and the engines ignited to regain orbital velocity. Figure 5.14 depicts an USAF Flight Dynamics Laboratory FDL-7 C/D glider making a plane change to rendezvous with another orbital vehicle in the distance. In actuality the rocket engines would be firing, but the artist omitted the engine plume to clarify the orientation of the maneuver. 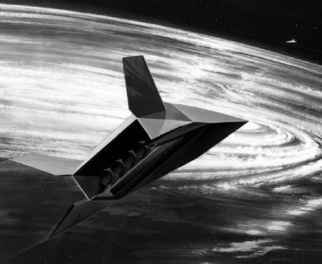 The hypersonic glider is generally a second stage of a TSTO vehicle sized as an automatic OMV, specifically for plane change maneuvers. The design payload is the same as for the space OMV, a 2,268 kg (5,000 lb) payload. The OMV cannot enter the Earth's atmosphere, so it is limited to space operations. The glider has the capability to enter the atmosphere if needed to operate as a rescue vehicle. The glider has an Earth's circumference glide range and can return to Earth without any prior preparation or waiting in orbit. With a payload bay of 36.5 m3 (1,289 ft3) capacity it could accommodate nine to twelve persons in pressure suits in an emergency situation. The propulsion systems described in Table 5.3 provide the specific impulse (Isp) for each of four systems OMVs. In space there is no atmospheric drag, so the ideal weight ratio equation applies, equation (5.8). For the hypersonic glider there is a about an 8% reduction in the specific impulse due to atmosphere drag during the turn maneuver. Translating the incremental velocity data and specific impulse data into weight ratio yields Figure 5.15.